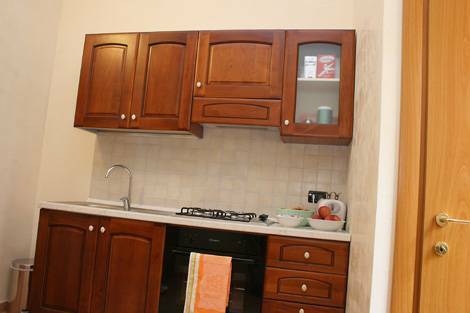 Holiday Paradise Roma is situated close to the Santa Maria Maggiore Basilica. The area is well connected to the historical centre of Rome and all its monuments because of the numerous bus routes to the centre, including bus route number 492, which takes you to the Colosseum, one of the monuments which attracts the biggest number of visitors in the world, in a short space of time. We would like to remind you that in our hotel it is possible to buy tickets for the Rome Open tour and Carrani tour tourist buses, which stop right in front of the Termini railway station. The area also has the subway A Line (the red line) and the B Line (blue line) which connect the hotel to the citys main historical attractions such as, for example, Saint Peters Cathedral and the Sistine Chapel (which is close to the Ottaviano subway stop on the A Line). The area, which is jam-packed with shops, is also ideal for those who love shopping. For people travelling by aeroplane, transport services are organised to and from Fiumicino and Ciampino airports. Holiday Paradise Roma Bed and Breakfast has three spacious rooms (double or triple according to the clients needs) all with on suite bathrooms. The hotel totally satisfies the needs of its guests thanks to the various modern comforts available to them. In fact each room has SATELLITE TELEVISION, AIR CONDITIONING, A SAFE, A HAIRDRYER AND A FRIDGE STOCKED WITH DRINKS. THE HOLIDAY PARADISE ROMA (HOLIDAY PARADISE ROME) also offers room service breakfast and room cleaning services on a 24 hour basis. The structure adapts perfectly to the needs of its guests thanks to the many modern conforts we offer them. The property is situated near to Santa Maria Maggiore Square, Cinquecento Square, Repubblica Square and Indipendence Square. Moreover from the structure you can easily reach many charms of the city such us the Colosseum, Navona Square, Spagna Square, the Basilica of San Giovanni and the Basilica of Santa Maria Maggiore, Fontana di Trevi. The rates concern the double rooms. In case of long soujourns(minimum 6 days) we apply a discount of 10%. At the moment of the booking we require the datails of a credit card as garancy. At the moment of the check in we require the complete payment(momentarely only in cash money). From the airport you can take the train until Termini station or you can choose to take the bus Terra@reservation which bring you to Termini station. From the Station Termini you can reach us in about 10 minuts walking. Underground Line A and Line B, taxi service and many lines of bus.